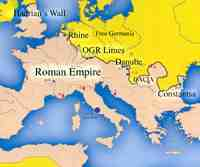 More then 400 years the rivers Rhine and Danube were the Northern border or limes of the Roman Empire. Hadrian’s Wall is also a part of the limes winding through the heart of Europe from the Irish to the Black Sea. For the Dutch public education television station (Teleac NOT) SMC developed a multimedia project ‘Traces of Romans and Batavians’. It consists of a series of six documentaries in combination with a book, a website and a touristic route. Subjects are the heritage traces of daily life along the Dutch part of the limes in classic times in the perspective of modern life. The outline of this project can be used for a Pan European multimedia project. Klick here to go to the 'MILUnet Operation'.